The Expert Advisor coded for EURUSD and GBPUSD pairs runs on M15 timeframe. This is a scalper strategy. The EA trades are based on volatility. The basic setup is running with risk 5.0. You can modify any time the risk factor, if you need. But you have to consider that increasing the risk factor resulting in a higher profit will increase the drawdown as well. The EA is dynamically modifying the trade size according to the money management. Turning off the money management you can set manually the LOT size. 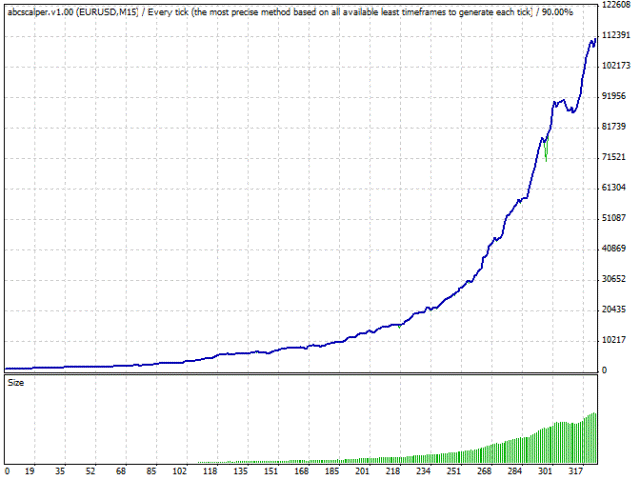 This Expert Advisor works great on ECN or low spread account (no more than 3 pips). Not working on real ECN account. Ne fonctionne pas, attention, le vendeur n'ai pas le concepteur du code source. !! Fuyez !! 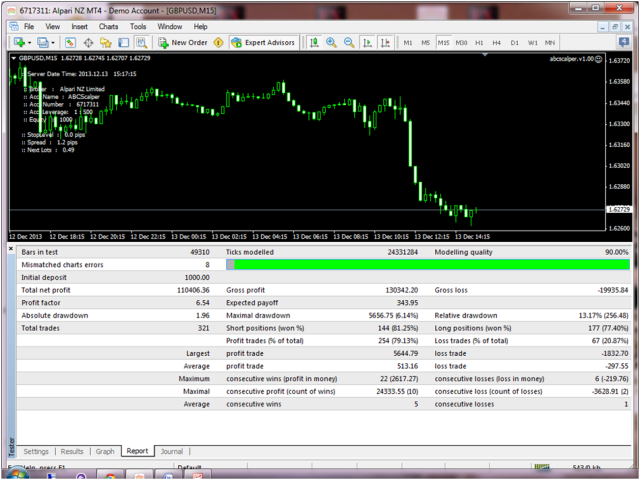 successful backtest and unfortunately not working on demo and real, i tested on both and just i lost in past 15 days !!! two positions won and 16 lost !!!! why the results are very different between the free demo and purchased in the strategy tester ??? ?, very bad !!! don't open an order in real account. ABCScalper test successfull strategy tester and open more order one day.but if use real or demo account dont open order all day. Сompletely transforming for more trading.